On a summer scouting mission, I glassed a very large buck coming out of thick bedding cover adjacent to a parking area on a public hunting property. I started keeping an eye on the spot from the safety of my car. If I parked in the right spot I could see where the buck crossed a creek onto the public from a thick tangle on nearby private land. I glassed the buck from my covert station wagon. I appeared as if I was parked reading the paper whenever someone drove passed. The buck was coming thru on a regular basis, but the common wind would blow right to the buck. The buck stayed on the pattern as hunting season opened but I patiently waited for a rare east wind. When the wind changed, I slid in for the hunt. It was the very first time I ever walked into that section of woods. I sat only a few feet off the ground in the crotch of a huge willow tree. I shot the big-bodied buck as he worked a small licking branch next to my perch. I believe most hunters who would’ve seen that buck like I did would have been smart enough to set up in that tree and wait for the right wind. But what separates me from other hunters is most would set up their stand after seeing the buck in late summer and then tried to hunt it, rather than sneaking in and killing the buck the day you hang it. When I look over my past success hunting whitetails there is one thing that stands out. The majority of my hunts are from stands that I have hunted in the past, but the majority of mature bucks I have shot have come from stands the very first time I ever sat them. I think the majority of hunters do not realize how important first-time sits are. Human scent can remain on your walking trail and at your stand site for a week or longer. Bucks do not get to be 5 years old or older by walking around in daylight where they smell hunters, or where they have smelled them in the past. If they have lived on that property for several years there is no doubt in my mind they know every spot hunters regularly hunt, and they avoid those spots in daylight. It is often said that the definition of insanity is doing the same thing over and over while expecting different results. Think about that in relation to your hunting for a minute. Are you stuck in a routine? Most hunters have four or five stand sites and rotate between them. They choose spots based on sign like rubs or scrapes, or put the stand over a food source, with no regard as to whether it’s daytime sign, or nighttime sign. But most hunters are not shooting mature bucks on public or pressured land consistently. If you’re not getting the results you desire, you may want to change up your approach, and the way you choose and hunt your spots. Sure, I have stand locations where I see a lot of deer, and even some nice bucks that I hunt a time or two every year, but I'm not talking about "deer" or average bucks. I'm talking about mature bucks. When you start hunting bucks 4 years old or older, it’s almost like you’re hunting a different species. Hunting deer and expecting to shoot a mature buck is like hunting rabbits while expecting to shoot a duck. A lot of hunters stay with it because they are seeing deer, thinking its a matter of time. If they are not target deer though, they may be wasting their time. I have had a lot of success on public land mature whitetails and I think the way I hunt is one of the top reasons. I spend an enormous amount of my time scouting. Mostly in winter and spring a long time from when I will hunt. I choose dozens of hunting spots and do as little prep work as possible, and try not to stay too long. When the season comes, I start hunting these spots and I take a portable stand with sticks on my back that I have modified to make as quiet as possible. On my way in I do not take the beaten path from the truck to the stand position. Instead, I scout my way in and out. If I hit fresh sign I hunt it right then before the buck has a chance to come thru and smell I was there. I do not set up a stand and then come back the next day, or next week. If I make it to my intended position and don't see the buck sign I expected, or I see hunter sign, I simply keep going until I find something I like. I think time in the stand is important, but I also think it’s important for it to be in the right spot at the right time. You can't kill a big buck while you’re sitting on the couch, but it can also be said that overhunting a spot, or hunting it at the wrong time, can also have bad results. To combat this, I spread myself thin, I hunt many public properties, a few private, and I apply for special hunts. So there’s no need for me to overhunt any one area. Choosing where to hunt is important too. I have often said that most hunters would up their odds if they threw a dart at a map of their hunting area and sat wherever it landed. That might sound funny. But I think most hunters would do better throwing the dart than sitting the same treestand every week with every buck knowing where they are. I try to think about where all the hunters are, and choose areas overlooked by others. Maybe they don't want to cross water or hunt near the road? Another great spot to look is downwind of stands that are in great spots but are overhunted. I find bucks often have a trail that loops downwind just out of site of the permanent stand position. Sometimes it’s 50 yards, sometimes 200. But if the stand is in a good spot and used often, I’d bet you’ll find the looping trail. A lot of the time it’s a hunter’s equipment that is the limiting factor. To hunt mobile and be in new and fresh spots often, you need a stand that will allow you to set up and take down quiet and easy without detection. Some hunters use climbers, but they can limit you to only straight, limbless trees. Big bucks often hang out in transition areas (edges) where there is a lack of straight limbless trees. I personally like portable stands with sticks. Usually, this is a bit heavier than a climber (depending on the brand) but the versatility gets me into any tree. I would rather be hunting for deer than hunting for a straight limbless tree. I will do the work and put up with the weight if it means more and bigger bucks. As big bucks travel through the woods avoiding areas they smell people, by hopping around and becoming a mobile hunter you will start to see more action with bigger deer, and they should be more at ease in areas they don't expect people. 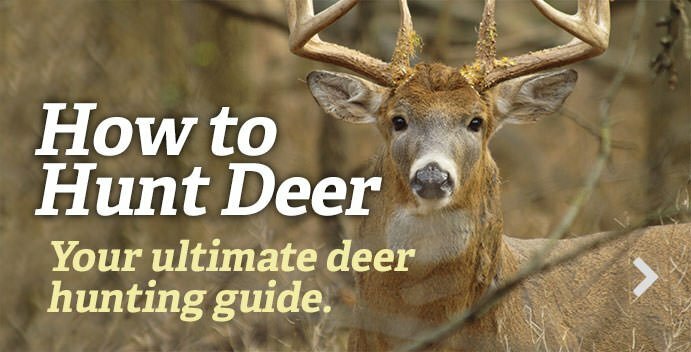 I have been killing great bucks consistently on high-pressure public areas using this technique simply by constantly moving to whatever area I feel has the least pressure and then moving again the next day. Editor's note: This was originally published October 25, 2016.